Bali has been inhabited for a long time. Sembiran, a village in northern Bali, was believed to have been home to the people of the Ice Age, proven by the discovery of stone axes and adzes. Further discoveries of more sophisticated stone tools, agricultural techniques and basic pottery at Cekik in Bali's far west, point to the people of the Neolithic era. At Cekik, there is evidence of a settlement together with burial sites of around a hundred people thought to be from the Neolithic through to the Bronze Age. The massive drums of the Bronze Age, together with their stone moulds have been discovered throughout the Indonesian archipelago, including the most famous and largest drum in Southeast Asia, the Moon of Pejeng, nearly two meters wide, now housed in a temple in east Ubud. In East Java and Bali, there has also been a concentration of carved stone sarcophagi, which we can see in the Bali Museum in Denpasar and Purbakala Museum in Pejeng. Bali was busy with trade from as early as 200 BC. The prasasti, or metal inscriptions, Bali's earliest written records from the ninth century AD, show a significant Buddhist and Hindu influence; especially in the statues, bronzes and rock-cut caves around Mount Kawi and Gajah Cave. Balinese society was pretty sophisticated by about 900 AD. Their marriage portrait of the Balinese King Udayana to East Java's Princess Mahendratta is captured in a stone carving in the Pura Korah Tegipan in the Batur area. Their son, Erlangga, born around 991 AD, later succeeded to the throne of the Javanese kingdom and brought Java and Bali together until his death in 1049. In 1284, Bali was conquered by Kertanegara, the ruler of the Singasari; until the turn of the century, saw Bali under its own rule under the hands of King Bedaulu of Pejeng, east of Ubud. 1343 AD, is an important date in Bali's history. It was then that the whole island was conquered by East Java under the mighty Hindu Majapahit kingdom. This resulted in massive changes in Balinese society, including the introduction of the caste system. Balinese who did not embrace the changes fled to the isolated and remote mountainous areas and hill areas. Their descendants are known today as Bali Aga or Bali Mula that means the "original Balinese". They still live separately in villages like Tenganan near Dasa Temple and Trunyan on the shores of Batur Lake, and maintain their ancient laws and traditional ways. When Majapahit in East Java fell in 1515, the many small Islamic kingdoms in the island merged into the Islamic Mataram empire, Majapahit's most dedicated Hindu priests, craftsmen, soldiers, nobles and artists fled east to Bali, and flooded the island with Javanese culture and Hindu practices. Considering the huge influence and power of Islam at the time, it is worth pondering why and how Bali still remained strongly Hindu and Buddhist. Batu Renggong, also known as Dewa Agung, means great god, became king in 1550, and this title became hereditary through the succeeding generations of the kingdom of Gelgel, and later Klungkung, until the twentieth century. 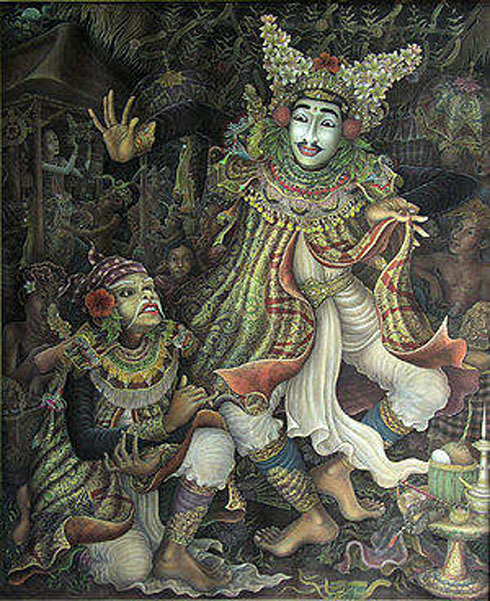 Bali reached the pinnacle of its Golden Era under the reign of the Batu Renggong, the great god ruler. Bali's decline started when Batu Renggong's grandson, Di Made Bekung, lost Blambangan, Lombok and Sumbawa. DI Made Bekung's chief minister, Gusti Agung Maruti, eventually rebelled and reigned from 1650 till 1686, when he in turn was killed by DI Made Bekung's son, Dewa Agung Jambe, who then moved the court to Klungkung, and named his new palace the Semarapura, Abode of the God of Love.